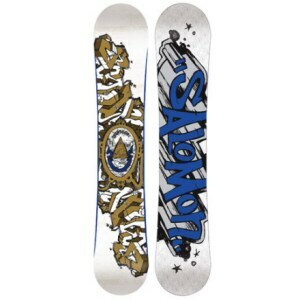 17895 Never Summer Evo Art Snowboard 2009 The Never Summer Evo is a stiffer, lighter, twin tip freestyle board tailor fit for the boarder who spends most of the day in the terrain park. This special edition snowboard has graphics that would make even Picasso lurch and croon with jealousy. The art on the board alone makes this a must have, but Never Summer, as usual, goes the extra mile and hooks up the exclusive Custom Flight Core a light as lint hardwood center matched with an absorption dampening system. This makes for some high energy hullabaloo on the half pipe. You'll carve out a happy ending to every trick with the new Vario Radius Side Cut which gives the board stable grip on even the iciest snow conditions. Thanks to the new Sintered P Tex Sidewalls, light mass doesn't make Never Summer's Evo a light weight. The durable, Crown Plastic coating makes this a solid ride from start to finish.